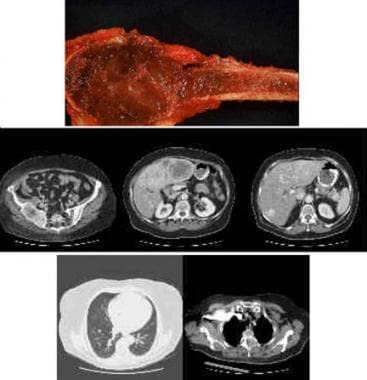 An angiosarcoma (AS) is an uncommon malignant neoplasm characterized by rapidly proliferating, extensively infiltrating anaplastic cells derived from blood vessels and lining irregular blood-filled spaces. Specialists apply the term angiosarcoma to a wide range of malignant endothelial vascular neoplasms that affect a variety of sites. Angiosarcomas are aggressive and tend to recur locally, spread widely, and have a high rate of lymph node and systemic metastases. The rate of tumor-related death is high. See the images below. This is a gross specimen from a proximal humerus bone angiosarcoma. These tumors generally are red and hemorrhagic. Although the tumor has not extended into the adjacent soft tissues, cortical erosion is evident. The patient was treated with wide excision and reconstruction with a humeral spacer. The patient's next oncologic recheck showed multiple lesions, including a large destructive lesion in the right ilium extending to the sacroiliac joint and the right sacral ala. Also noted was an upper thoracic vertebral lesion, multiple indeterminate pulmonary nodules, extensive hepatic metastases most marked in the left lobe, and an indeterminate left adnexal mass. Cutaneous angiosarcoma is more frequent in males than in females, with a male-to-female ratio of 2:1. Bone angiosarcoma appears most often in adults (second to seventh decades of life). Young RJ, Brown NJ, Reed MW, Hughes D, Woll PJ. Angiosarcoma. Lancet Oncol. 2010 Oct. 11(10):983-91. [Medline]. Scow JS, Reynolds CA, Degnim AC, Petersen IA, Jakub JW, Boughey JC. Primary and secondary angiosarcoma of the breast: the Mayo Clinic experience. J Surg Oncol. 2010 Apr 1. 101(5):401-7. [Medline]. Buehler D, Rice SR, Moody JS, Patrick Rush, et. al. Angiosarcoma Outcomes and Prognostic Factors: A 25-Year Single Institution Experience. Am J Clin Oncol. 2014 Oct. 37(5):473–479. [Medline]. Terada T. Angiosarcoma of the mandibular gingiva. Int J Clin Exp Pathol. 2011. 4(8):791-3. [Medline]. [Full Text]. Sturgis EM, Potter BO. Sarcomas of the head and neck region. Curr Opin Oncol. 2003 May. 15(3):239-52. [Medline]. Soft Tissue Tumors. Enzinger FM, Weiss SW, eds. Soft Tissue Tumors. 3rd ed. St. Louis, Mo: Mosby; 1995. 648-77. Ferrari A, Sultan I, Huang TT, Rodriguez -Galindo C, et.al. Soft Tissue Sarcoma Across the Age Spectrum: A Population-Based Study from the Surveillance Epidemiology and End Results Database. Pediatr Blood Cancer. 2011 Dec 1. 57(6):943–949. [Medline]. National Cancer Intelligence Network. Soft tissue sarcoma incidence and survival; tumours diagnosed in England between 1985 and 2009. www.ncin.org.uk. Available at http://www.ncin.org.uk/cancer_type_and_topic_specific_work/cancer_type_specific_work/sarcomas/. 2012; Accessed: 25/08/2018. Singal S, Papavasiliou P, Powers B, Gaughan J, et. al. Challenges in the treatment of angiosarcoma: a single institution experience. Am J Surg. 2014 August. 208 (2):254-259. [Medline]. Fayette J, Martin E, Piperno-Neumann S, Le Cesne A, et. al. Angiosarcoma. A report of 67 patients and a review of the literature. Ann Oncol. 2007 Dec. 18(12):2030-6. [Medline]. Schottenfeld D, Fraumeni J, eds. Cancer. Epidemiology and Prevention. 3rd ed. New York: Oxford University Press; 2006. 763-786/959-974. E. Palmerini, R.G. Maki, E.L. Staals, M. Alberghini, et. al. Primary angiosarcoma of bone: A retrospective analysis of 60 patients from two institutions. Am J Clin Oncol. 2014 Dec. 37(6):528–534. [Medline]. Lahat G, Dhuka AR, Hallevi H, Xiao L, Zou C, Smith KD, et al. Angiosarcoma: clinical and molecular insights. Ann Surg. 2010 Jun. 251(6):1098-106. [Medline]. DeVita VT Jr, Lawrence TS, Rosenberg SA, eds. DeVita, Hellman, and Rosenberg's Cancer: Principles & Practice of Oncology. 10th ed. Philadelphia, Pa: Wolters Kluwer; 2015. Virtanen A, Pukkala E, Auvinen A. Angiosarcoma after radiotherapy: a cohort study of 332 163 Finnish cancer patients. The British Journal of Cancer. Jul 2007. 97:115. [Medline]. Patton KT, Deyrup AT, Weiss SW. Atypical vascular lesions after surgery and radiation of the breast: a clinicopathologic study of 32 cases analyzing histologic heterogeneity and association with angiosarcoma. Am J Surg Pathol. 2008 Jun. 32(6):943-50. [Medline]. USA: National Cancer Institute (NCI); 2000-2004. The Surveillance, Epidemiology, and End Results (SEER) Program. Available at http://seer.cancer.gov/. Wenger DE, Wold LE. Malignant vascular lesions of bone: radiologic and pathologic features. Skeletal Radiol. 2000 Nov. 29(11):619-31. [Medline]. Morgan MB, Swann M, Somach S, et al. Cutaneous angiosarcoma: a case series with prognostic correlation. J Am Acad Dermatol. 2004 Jun. 50(6):867-74. [Medline]. American Joint Committee on Cancer. Soft Tissue Sarcomas. Amin MB, Edge S, Greene F, Byrd DR, Brookland RK, et al, eds. AJCC Cancer Staging Manual. 8th ed. New York: Springer; 2017. [Guideline] NCCN. National Comprehensive Cancer Network Clinical Practice Guidelines in Oncology: Soft Tissue Sarcoma. Available at https://www.nccn.org/professionals/physician_gls/pdf/sarcoma.pdf. Version 2.2018 — March 27, 2018; Accessed: July 11, 2018. Ravi V, Sanford EM, Wang WL, Ross JS, Ramesh N, Futreal A, et al. Antitumor Response of VEGFR2- and VEGFR3-Amplified Angiosarcoma to Pazopanib. J Natl Compr Canc Netw. 2016 May. 14 (5):499-502. [Medline]. Budd GT. Management of Angiosarcoma. Curr Oncol Rep. 2002. 4(6):515-519. [Medline]. Pasquier E, André N, Street J, Chougule A, Rekhi B, Ghosh J, et al. Effective Management of Advanced Angiosarcoma by the Synergistic Combination of Propranolol and Vinblastine-based Metronomic Chemotherapy: A Bench to Bedside Study. EBioMedicine. 2016 Apr. 6:87-95. [Medline]. [Full Text]. Jenkins K. Propranolol in Angiosarcoma: First Major Advance in Decades. Medscape Medical News. Available at http://www.medscape.com/viewarticle/875136. January 31, 2017; Accessed: July 11, 2018. Amaya CN, Perkins M, Belmont A, Herrera C, Nasrazadani A, Vargas A, et al. Non-selective beta blockers inhibit angiosarcoma cell viability and increase progression free- and overall-survival in patients diagnosed with metastatic angiosarcoma. Oncoscience. 2018 Mar. 5 (3-4):109-119. [Medline]. [Full Text]. Skubitz KM, Haddad PA. Paclitaxel and pegylated-liposomal doxorubicin are both active in angiosarcoma. Cancer. 2005 Jul 15. 104(2):361-6. [Medline]. Mullamitha SA, Ton NC, Parker GJ, Jackson A, Julyan PJ, Roberts C, et al. Phase I evaluation of a fully human anti-alphav integrin monoclonal antibody (CNTO 95) in patients with advanced solid tumors. Clin Cancer Res. Apr 2007. 13(7):2128-35. [Medline]. Lyou Y, Barber E, Mehta R, Lee T, Goreal W, Parajuli R. Radiation-Associated Angiosarcoma of the Breast: A Case Report and Literature Review. Case Rep Oncol. 2018 Jan-Apr. 11 (1):216-220. [Medline]. [Full Text]. Vogt T, Hafner C, Bross K, et al. Antiangiogenetic therapy with pioglitazone, rofecoxib, and metronomic trofosfamidein patients with advanced malignant vascular tumors. Cancer. 2003 Nov 15. 98(10):2251-6. [Medline]. Liekens S, Verbeken E, De Clercq E, Neyts J. Potent inhibition of hemangiosarcoma development in mice by cidofovir. Int J Cancer. 2001 Apr 15. 92(2):161-7. [Medline]. This is a classic example of angiosarcoma associated with chronic lymphedema after lymphadenectomy and radiotherapy. The patient is a 33-year-old woman who presented with a recurrent grade 2 angiosarcoma of the soft tissue after an attempt at wide excision and skin graft. Two weeks following this procedure, she developed multiple subcutaneous erythematous nodules involving the back and overlying the right scapula region, the supraclavicular fossa, the right breast, and arm. The window shows a microphotograph of the tissue obtained from the biopsy (hematoxylin and eosin stain, original magnification X160). Histologic preparation reveals neoplastic endothelial cells showing a solid pattern with occasional mitotic figures and sporadic protruding growth into the vascular lumens. This radiograph is from a 27-year-old woman who had preexisting mild pain in her left clavicle for a couple of weeks. She woke up one morning with severe pain. Radiographs showed a pathological fracture through a lytic lesion. The permanent section of the needle biopsy is shown in the window and was read as a grade 1 angiosarcoma. The cell morphology varied from epithelioid to spindle-shaped with indistinct borders. Most nuclei were large and vesicular, containing irregular large eosinophilic nucleoli and frequent mitoses. Physicians also found anastomosing vascular channels lined by pleomorphic malignant cells. CT scan, MRI, and bone scan from a 27-year-old woman with grade 1 angiosarcoma who presented with a pathological fracture through a lytic lesion on her left clavicle. Note the expansile lytic lesion in the left clavicle accompanied by a soft tissue mass visible on the MRI. No other lesions are identifiable. Regional lymph nodes are visible by MRI, and they do not appear involved. Lungs are clear. She was treated with wide resection of the clavicle, leaving both bony ends. No further reconstruction was attempted. Eighteen months after surgery, she is free of disease and has a full range of motion in the left shoulder. The residual aesthetic deformity is minimal. This 71-year-old man presented with a dark lesion on his scalp. The lesion was first treated with an excisional biopsy performed by his local physician; the lesion recurred quickly. He was treated with wide excision and adjuvant radiation therapy. The specimen (hematoxylin and eosin, original magnification X12.5) shows a well-differentiated cutaneous angiosarcoma composed of irregular vascular channels. This young woman presented with multicentric angiosarcoma. The images show several bones of the right foot, the right distal femur, and the right patella affected with the process. The microphotograph of the specimen revealed a grade 2 angiosarcoma (hematoxylin and eosin, original magnification X100). Most bone tumors are solitary lesions with a very low incidence of multicentricity. Vascular tumors are an exception and may involve multiple bones. Angiosarcoma presents in this case as multiple lytic lesions in the same extremity. This is a soft tissue angiosarcoma presenting as a rapidly growing mass in the calf. This 69-year-old woman was treated with wide resection of the mass followed by external beam radiotherapy. The full-thickness graft obtained from the ipsilateral thigh at the moment of surgery aided in the closure and prevented further wound complications during the adjuvant radiotherapy. The rapid growth of soft tissue angiosarcomas explains why they are often misdiagnosed as abscesses and tentatively treated with drainage. The drainage is sanguinous, with blood clots, and hemostasis may be challenging. To avoid this problem, fine-needle aspiration should precede any attempt at incisional or excisional biopsy of a soft tissue mass. This 45-year-old man presented with progressive pain in his left hip. Activity-related at first, the pain turned constant. The patient described it as a dull ache and a boring sensation, with occasional stubbing episodes. The pelvic bone involvement was extensive. The patient was treated with an external hemipelvectomy. The patient survived for 1.5 years. Disclosure: Received honoraria from BMS for speaking and teaching; Received consulting fee from Novartis for consulting; Received consulting fee from Merck for consulting.